The aim of the present study was to evaluate the influence of the applied safety margins of modern intensity-modulated radiotherapy (IMRT) in patients with high-grade meningiomas on local control and recurrence patterns. Twenty patients with a neuropathological diagnosis of a high-grade meningioma (WHO°II or °III) treated with adjuvant or definitive radiotherapy between 2010 and 2015 were included in the present retrospective analysis. All patients were planned PET-based. Recurrence patterns were assessed by means of MRI and/or DOTATATE-PET/computertomography (CT). The median follow-up was 31.0 months [95% confidence interval (CI): 20.1–42.0] and the progression-free survival (PFS) after 24 months was 87.5%. Overall, four patients had a local recurrence of their meningioma. Of these, three were located in field according to the prior radiotherapy treatment region, while only one patient had a distant relapse. There were no independent factors influencing progression-free or overall survival (OS). After radiotherapy (RT), patients with atypical or anaplastic meningiomas still have a defined risk of tumor recurrence. The aim of the present study was to examine mono-institutional data concerning target volume definition and recurrence patterns after radiotherapy of high-grade meningiomas as there are limited data available. Our data suggest that extended safety margins are necessary to achieve a favorable local control for high-grade meningiomas. Meningiomas account for 20–30% of all primary intracranial neoplasms and represent the most common intracranial tumors in adults [1–4]. High-grade meningiomas show an excessive mitotic index on histopathological examination . Additional criteria for the diagnosis of atypical meningiomas are brain invasion or three of the five following histopathological aspects: prominent nucleoli, high cellularity, small cells, spontaneous necrosis or sheeting, i.e. loss of whorling or fascicular architecture [6, 7]. Overall, high-grade meningiomas (WHO (World Health Organisation) °II and °III) show a significantly more aggressive behavior and poorer outcome as compared to low-grade meningiomas [8–14]. A multimodal treatment approach with a combination of surgery and radiotherapy (RT) is nowadays considered to be the treatment of choice [8, 15]. Due to the frequent adhesion to neurological structures such as the optical nerve, optical chiasm or brainstem, gross total resections remain challenging . Therefore, postoperative RT is recommended for most cases of atypical meningiomas WHO grade II and all anaplastic meningiomas WHO grade III. A large multicenter analysis with more than 2000 patients by Wang et al. concludes that adjuvant radiotherapy after subtotal resection of an adjuvant meningioma significantly improves the overall survival while it does not after gross total resection . As Condra et al. pointed out, high-grade meningiomas have a poorer outcome as compared to low-grade meningiomas and benefit from a more aggressive treatment including postoperative radiotherapy , as RT is known to significantly improve local control . Over the past decades, radiotherapy techniques improved substantially, as new modalities such as intensity modulated radiotherapy (IMRT) or the image-guided application of radiotherapy (IGRT) using robotic patient positioning couches increasing the precision and accuracy of radiotherapy . Thus, radiotherapy has become a more valuable treatment option in the management of high-grade meningiomas. While the indication for postoperative RT in high-grade meningiomas appears undoubted, the appropriate target volume definition and radiation dose remain a matter of debate. We present a mono-institutional retrospective analysis on the recurrence patterns of high-grade meningiomas after RT with a special emphasis on radiation dose and safety margins of target volumes. Patients with histopathologically proven atypical or anaplastic meningioma who underwent RT at our department from 05/2010 to 09/2015 were included in this retrospective study. Even if patients did not have prior surgery within 12 weeks before radiotherapy, there was a former histopathological result confirming a high-grade meningioma. Patients were excluded if they had prior radiosurgical treatment or EBRT at the same site. Altogether 20 patients with atypical or anaplastic meningioma were included in this analysis. All of them were initially PET-positive and therefore were planned DOTATATE-based. Fourteen patients had prior surgery, while six patients were treated with definitive radiotherapy. Patients’ and tumor characteristics are shown in Table 1. All patients gave their written informed consent for the treatment. This retrospective analysis was approved by the ethics committee of the LMU Munich on record number 545–16. There was no experimental research on humans or animals performed or reported. The declaration of Helsinki has been obeyed in all points. The outcome was evaluated on a regular basis (first time three months after RT, later once per year) using an MRI of the brain and/or DOTATATE-PET-CT in case of suspicious MRI findings. Similarly to the study of Lee et al. recurrence of the tumor was defined as “in-field” if more than 80% of the tumor were located within the prescribed 95%-isodose . A “marginal” recurrence was present if 20–80% were inside the 95%-isodose surface. And any other recurrence was defined as “ex-field”. If there was multifocal recurrence, the tumor volume that was most distant to the initial tumor site was taken as a reference. Overall survival (OS) as well as progression-free survival (PFS) and local progression-free survival (LPFS) were measured from the beginning of RT to progression, death or respectively the date of last follow-up. For the latter, patients who died because of medical co-morbidities or had a distant relapse were censored. The Kaplan-Meier method was used for survival analysis. 95% confidence intervals (CI) were calculated using the associated estimated standard errors. Survival estimates were compared using the log-rank test. A Cox regression analysis was performed to identify factors influencing overall survival or progression-free survival. P-values were considered as significant at ≤0.05. A summary of baseline patient, tumor and treatment characteristics is shown in Table 1. Median age was 59.7 years (range 26–79 years). Sixteen patients had a meningioma grade II and four patients had a meningioma grade III. Fourteen patients underwent surgery before RT (within ≤12 weeks). Four patients had a relevant time delay to the start of RT due to various reasons (refusal, comorbidities). Two patients had no surgery prior to RT, as the tumor volume was too extensive. Surgery resulted in a gross total resection in 10 cases, subtotal in three and a debulking resection in one case. Grading for the extent of tumor resection was determined according to the study of Simpson et al. . Nine patients had a Simpson-grade I resection, one patient a grade II resection, three had a grade IV resection and one had a Simpson-grade V resection. Nine of the patients having surgery within 12 weeks before radiotherapy had undergone at least one other previous resection before the surgery that led to radiotherapy. Tumor localization was frontal (70%), frontoparietal (15%), frontotemporal (5%), occipital (5%) and parietooccipital (5%). Concerning radiotherapy, median number of fractions was 30 (28–33) with a median dose per fraction of 2.0 Gy (1.8–2.14 Gy) and a median total radiation dose of 60.0 Gy (59.4–60.0 Gy) (Table 1). Moderate hypofractionation (single dose 2.14 Gy) was only exceptionally used as simultaneous integrated boost (SIB) dose in two cases (59.92 Gy cumulative SIB dose). All patients had a pre-radiotherapeutic [68Ga]-DOTATATE-PET-CT. Mean tumor maximum standardized uptake volume (SUVmax) was 9.76 (0–25.3). Fig. 1 shows a patient with a right frontal meningioma where the additional [68Ga]-DOTATATE-PET-CT shows an impressive infiltration of the skull base which was not unequivocally visualized by postoperative MRI. The median cumulative margin from gross tumor volume (GTV) to planning target volume (PTV) was 20 mm at maximum, in median 15 mm to generate the CTV and additional 4 mm in median for PTV. In five patients, the pre-operative volume was mainly used to define the adapted clinical target volume, in all other patients either remaining macroscopic tumor or the resection cavity was used. Six patients had a concept with a simultaneous integrated boost (SIB). We considered the high-dose volume as the PTVboost in case of a SIB and the surrounding PTV-volume as PTVextended (PTVext). In cases without SIB the PTV was named PTVhomogeneous (PTVhom). For PTVboost the GTV was expanded 3 mm in median. Four of the 20 patients had a relapse of their meningioma. Regarding recurrence patterns, two patients (10%) with a recurrence after radiotherapy had an in-field recurrence concerning the PTVhom. One patient (5%) had radiotherapy with a simultaneous integrated boost concept whose recurrence was located in field of the PTVext but a marginal recurrence regarding the PTVboost. Another patient developed a distant relapse of the tumor, which may be considered as a second meningioma without any relation to the primary lesion. Regarding the in-field relapses, all patients had macroscopic tumor at the time of RT: in one case, there was a debulking resection prior to radiotherapy, in another case there was a relapse of the tumor after surgery and in the third case, there was no resection possible, as the tumor, volume was considered too large. One recurrence occurred in a patient with an anaplastic meningioma, the other three occurred in patients with atypical meningioma. There is no statistical significance, which is due to the small number of only four patients having a recurrence. In two cases, recurrence was diagnosed by MRI and DOTATATE-PET/CT. In the two other cases, recurrences were also diagnosed by MRT and PET, but surgery was performed afterwards so that there is also a histopathological proof for the recurrence. Median follow-up was 31.0 months [95%-CI: 20.1–42.0]. Median overall survival was 64.7 months [95%-CI: 52.6–76.8] (Fig. 2). Two patients died shortly after treatment, one of them had a relapse of the tumor. Both deaths were not related to the meningioma. 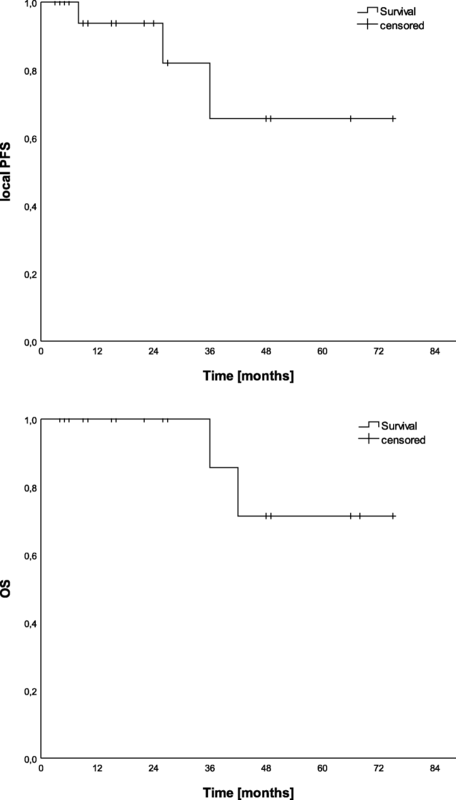 Local progression free survival was 87.5% after 24 months and 70% after 36 months (Fig. 2). Patients presenting with a local recurrence had a median margin from GTV to CTV of 12.5 mm plus another 4 mm margin for PTV (either PTVext or PTVhom). In one patient with a local relapse who had a SIB concept, the GTV was planned as boost volume without any additional safety margin. In one case with a recurrence, there were relatively small safety margins from GTV to PTV (5 mm in total), the other three patients presenting with local relapse adequate margins of at least 15 mm were identified. Therefore, the detected tumor relapses would not have been avoided by using larger margins. Only in the case of the SIB-concept, a larger safety margin to the PTVboost would have been advantageous but was not possible because of the surrounding organs at risk (optical system). Overall, radiotherapeutic toxicity was low. Despite mild radiodermatitis Grade I-II (n = 9), there were no higher graded toxicities such as radiation necrosis. One patient suffered from a transitory severe hyperglycemia associated to steroid medication given due to increased intracranial pressure. On univariate analysis for categorical variables (Table 2), no significant factors influencing OS or PFS were identified (age < 50 years, WHO grade, SIB or non-SIB-concept, type of resection (total vs. subtotal/biopsy), histology or Simpson grade of resection). For continuous variables such as age, SUVmax, time between DOTATATE-PET and treatment beginning, timing of RT (post-operative versus salvage), size of the PTVhom/ext no influence on PFS or OS could be detected as well. All patients were DOTATATE-planned and there was a slight trend that patients with a high SUVmax were more likely to have a relapse of the tumor reflecting macroscopic tumor at the beginning of the treatment. The aim of the present study was to examine mono-institutional data concerning target volume definition and recurrence patterns after radiotherapy of high-grade meningiomas as there are limited data available. Table 3 shows an overview of the existing data in comparison to our study. Compared to the existing literature this analysis shows a favorable local control rate for high-grade meningioma after radiotherapy with a total dose of 60 Gy and a safety margin of 15 mm for CTV and additional 4 mm for PTV. In the present analysis, most recurrences were observed in field in patients with macroscopic tumors. A local dose escalation could probably improve the local control rates and should be evaluated in further studies. In comparison with other studies we could not identify factors which influenced overall or progression-free survival. In contrast to other studies, all treatments of the present analysis were planned by using an MRI and a [68Ga]-DOTATATE-PET/CT fusion. Usually, target delineation is mainly based on contrast-enhanced MRIs (pre- and postoperative) only [25, 26]. Additional [68Ga]-DOTATATE-PET/CT scanning can provide valuable information on bone infiltration or dural tails . Goyal et al. noticed that atypical meningioma benefit from gross total resection (Simpson Grades I-III), as gross total resection is associated with better local control rates, but he concludes that the role of postoperative RT remains unclear . In contrast, Milosevic et al. recommend immediate RT after initial surgery for high-grade meningiomas . Choi et al. conclude with the fact that postoperative radiotherapy could improve local control in patients with high-grade meningiomas after incomplete surgical resection and emphasize that a gross total resection is the most important factor for local control . In contrast to these studies, Champeaux et al. failed to demonstrate a significant improvement in different clinical outcomes after RT for meningioma grade II . We could not identify a difference between patients treated post-operative or salvage, which is likely due to our small number of patients. Goldsmith et al. suggested a radiation dose of 60 Gy for high-grade meningiomas . This suggestion is based on their retrospective analysis of 140 patients whereas 23 of them had a malignant type of meningioma and were treated in median with 54 Gy (range 44.62 to 69.26Gy) . Katz et al. performed an analysis with an accelerated hyperfractionated RT for patients with atypical and anaplastic meningioma . Thirty-six patients were treated with 60 Gy in 1.5 Gy single dose twice per day . Local control rate was significantly poorer with 45% in comparison to less aggressive treatment schedules but caused significantly higher toxicity . This study concluded that 50–60 Gy delivered with once-daily fractionation seems feasible as it looks unlikely that more aggressive RT could improve outcome . Combs et al. suggest on the one hand that PTV has to be enlarged to the resection cavity plus a safety margin of 1–2 cm and on the other hand advocate for a dose escalation to 60–66 Gy . The results of the EORTC-trial 22,042–26,042 are eagerly awaited and will highlight the role of dose escalation in this setting. In this trial, patients with Simpson grades 1 to 3 receive standard postoperative RT, while patients with a higher grade receive an additional boost. There are also few data indicating that hypofractionation might be an effective option. Maranzano et al. describe their long-term results of moderate hypofractionated stereotactic radiotherapy for intracranial meningiomas . In this study 77 patients were treated with a median volume of 23 cm3 while dose was prescribed either in 15 × 3 Gy or 14 × 3 Gy . The authors conclude that moderate hypofractionation had a good outcome and was tolerated well  whereas a longer follow up and further trials should be performed to corroborate these findings. However, any kind of dose escalation or hypofractionation should be done carefully, considering the adjacent organs at risk and their dose tolerance. Bostrom et al. report about a patient developing severe radiation necrosis due to the RT in several lesions (some of them treated hypofractionated) . Considering the planning process and the safety margins an analysis by Press et al. found that meningioma grade II treated with conformal IMRT and limited safety margins < 1 cm, did not lead to a higher rate of recurrence . Six of 46 patients had a tumor relapse . The study confirms the findings of the present analysis, as most relapses occurred “in-field”. Press et al. found 5 of 6 recurrences within the prior radiation volume and one was combined in-field and marginal . A safety margin of 5 mm for CTV and 3 mm for PTV was applied in this patient cohort . Press et al. postulate that as none of their patients relapsed marginally safety margins of < 1 cm might be sufficient . In contrast to the present study, the majority of patients did not have macroscopic tumor. Taken together, the margins for grade II meningiomas cannot be transferred unreflectedly to meningiomas grade III. Regarding the existing studies a limited safety margin might be an option for some atypical meningiomas grade II, but for anaplastic meningiomas grade III a limited safety margin might be harmful and could lead to tumor relapse. The present data suggest that safety margins for anaplastic meningiomas have to be sufficiently large. Over the last decades, modern radiotherapy techniques (IMRT or volumetric modulated arc therapy (VMAT)) were introduced in the treatment of meningiomas. Anvari et al. conclude that utilizing high-technology equipment and new techniques might improve the outcome after RT . Madani et al. describe that dose-painting intensity-modulated proton therapy (IMPT) using a SIB is a feasible therapy option with excellent dose coverage with minimal or no dose to brain, brainstem or optical system . A study by Simon concludes that carbon-ion RT could be the preferred therapy option . Similarly, Harrabi et al. describe that proton beam RT shows dosimetric advantages over conventional radiotherapy that might be essential for neurologic function . Therefore, future concepts might include carbon-ion or proton RT. The present study is limited due to its retrospective nature and the small number of patients. Obviously the number of or presented patients is smaller than in most of the mentioned studies in Table 3. In contrast you have to consider that in the other mentioned studies, there are all kind of meningioma, not only high-grade meningiomas as presented here. The follow-up time has a wide range, as some patients had to be censored very early. Furthermore, a multivariate analysis was not reasonably feasible due to the small number of cases, which is another weakness of the analysis. Even following postoperative radiotherapy, high-grade meningiomas relapsed frequently “in-field” of the prior target volume. We consider postoperative radiotherapy after resection of a high-grade meningioma essential to minimize the risk of local failure, even if a gross total resection of the tumor was performed. Especially patients with macroscopic tumor should receive postoperative RT immediately. Patients who cannot be treated with a resection of the tumor at all should receive a definitive radiotherapy. Concerning target volume delineation, the present data show a good local control with the applied margins and confirm the common used safety margins. We suggest a CTV margin of 15 mm starting from the GTV and additional 3–5 mm for the PTV, depending on the available image-guidance. It would be valuable to have future studies including a higher number of patients to evaluate which patients would benefit from a dose escalation, e.g. in form of a simultaneous integrated boost, or a CTV margin reduction. We thank Mrs. Sabine Sirges-Szasz and Ms. Vera Muehlberger for their support in contacting patients and/or the patients’ general practitioners for information about progression and survival. There was no writing assistance. BZ and MN planned, coordinated and conducted the retrospective analysis. NA helped with data acquisition concerning the nuclear medical data. BZ, UG and MN analyzed the diagnostic imaging data as well as the treatment planning data. BZ provided follow-up data. CM helped providing patient data. BZ, UG, SC, CM, NA, CS, CB and MN drafted the manuscript. All authors read and approved the final manuscript. Approval by the ethics committee of Ludwig-Maximilians-Universität is on record no. 545–16.